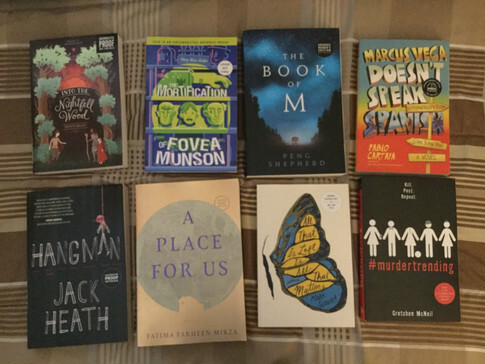 A book blog dedicated to reviews, lists, unboxings, and more! Recently my coworker brought in some Advance Reader Copies of some books and let me take what I wanted, and admittedly I don't know much about each of them so I'm just going to say what it is and who wrote it, but a book is a book am I right? To start I got three middle-grade books which are Into the Nightfell Wood by Kristin Bailey which I know is a sequel in a series, The Mortification of Fovea Munson by Mary Winn Heider, and Marcus Vega Doesn't Speak Spanish by Pablo Cartaya. The next four are fiction books and they are The Book of M by Peng Shepherd, Hangman by Jack Heath, A Place for Us by Fatima Farheen Mirza, and #Murdertrending by Gretchen McNeil. The final is a collection of short stories called All That is Left is All That Matters: Stories by Mark Slouka. Overall we have eight interesting sounding books that I can hopefully read before they are published! I received an early copy of this book from the publisher via Library Thing in exchange for an honest review. Glass and Gardens is an anthology of short stories all about futures with worlds that are essentially utopian, or in short an optimistic version of steampunk. Overall I gave the book 3/5 stars because it wasn't my cup of tea in the end. Take a look down below for what I have to say about each story, going from highest rating to lowest. These two stories were my favorites out of the anthology. I found The Spider and the Stars to be such a cute and interesting story to read about a future where humans learn to love bugs, and The Heavenly Dreams of Mechanical Trees was a hopeful story about a sentient mechanical tree who was soon going to stop functioning. Thank you to Apex Book Company for sending me a free copy in exchange for an honest review. Aetherchrist by Kirk Jones was a fascinating read, to say the least. It reminded me of an episode of Black Mirror, a twisted version of today's world where a man keeps seeing his own death playing over and over again on TV. I will admit at first it was hard to get into because the author goes right into the story with very little world building and descriptions, but as the story goes on it's easier to understand. I found the story to be a perfectly haunting sci-fi thriller, but there were a few things I had problems with. The author's writing is all around good but every now and then I read some phrases that I just couldn't help but cringe at. The other thing was the weird, to me uncesseccary, sexual scenes that in my opinion really added nothing to the story. Even though I had trouble with these things, once you really get into the story they become less noticeable. When I had first heard that Veronica Roth was releasing a new book, Carve the Mark, a little over a year ago I was so excited because I was such a huge fan of the Divergent series. It ended up being that I didn't like Carve the Mark very much, but that's not what we're here to discuss today. When I preordered Carve the Mark I was able to send in a copy of my receipt so that I could receive an exclusive epilogue to the Divergent series. I was so excited because Divergent was one of my favorite series, so I waited for the epilogue to arrive. And I waited some more. And I waited some more. But it just never showed up. To my delight, a user on Goodreads sent me a link to a PDF of it online and I got so excited and read it immediately... and my excitement quickly shrunk. Is it possible to give a book negative stars? Because that's what I really feel about this one. To be completely honest it's one of the worst things that I've ever read in my life. Daniel has read 39 books toward his goal of 100 books.